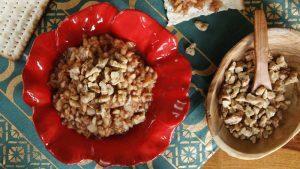 Here at DiabetesSelfManagement.com, we’ve discussed the health benefits of eating nuts in the past: how they might make you live longer, and how walnuts, in particular, could reduce the risk of developing Type 2 diabetes. Now, a new analysis looks at many previous studies on nuts together, giving an overall view of their benefits — and the amount of nuts you’d need to eat to receive them. Published earlier this month in the journal BMC Medicine, the analysis included 29 different studies involving about 819,000 participants. These studies looked at the relationship between eating nuts and a number of different health outcomes: coronary heart disease, stroke, cardiovascular disease, cancer, death from all causes, and death from certain conditions (including death associated with diabetes). 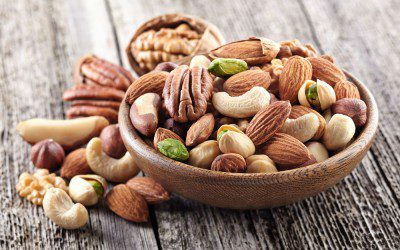 In each category, researchers looked at the effects of eating both tree nuts (most nuts, including walnuts, pecans, almonds, and cashews) and peanuts (which technically aren’t nuts — they’re legumes). As noted in a news release about the analysis from Imperial College London (where some of the study authors were based), researchers calculated the health effects of eating just one serving of nuts each day: 20 grams, or about a handful. This relatively small serving size was found to be associated with a sizable impact on a number of different disease risks. Eating this dose of nuts was link with a 29% reduction in the participants’ risk of coronary heart disease, 21% reduction in their risk of cardiovascular disease, 15% reduction in their risk of cancer (all types combined), and 22% reduction in their risk of death from all causes. The risk of death from respiratory disease was reduced by a whopping 52%, and the risk of diabetes-related death was 39% lower — all associated with eating a handful of nuts. In some of these categories, tree nuts were found to have a larger beneficial impact than peanuts, and in others the reverse was true — but in most cases, there weren’t drastic differences between the two. So based on these results, it’s probably a good idea to include a variety of nuts and peanuts in your diet. The researchers note that nuts (and peanuts) are high in healthy unsaturated fats, fiber, and protein, and that some types of nuts — like walnuts and pecans — are also high in antioxidant compounds that may help reduce damage to certain cells in the body. It’s worth noting, though, that nuts aren’t a low-calorie food — 20 grams contain about 110 to 145 calories, depending on the type of nut. Furthermore, nuts are often salted and may be roasted in oil, leading to their containing less healthy forms of fat than simple, raw nuts do. Still, it seems that the health benefits from eating such a small amount of nuts should outweigh these concerns in most people. Notably, the researchers found that there don’t seem to be additional health benefits from eating much more than 20 grams of nuts daily. What’s your relationship with nuts — do you like them, and do you eat them regularly? Do you think it’s easy to eat just a handful of nuts each day, every day? Do you find nuts as filling or satisfying as other snacks? Are you more likely to eat them after hearing about this study? Leave a comment below!